A teleporter (left) and teleporter exit (right) in Halo: Combat Evolved. A teleporter, also known as a translocation platform, is a device using the principle of slipspace translocation, allowing for near-instantaneous transport over short distances to another teleporter or teleporter exit point. Teleporters often make up the main components of a teleportation grid on Forerunner installations, although the teleportation grids on the Halo rings allow translocation from any location on the ring without a fixed teleporter. A teleporter in Halo 4. The teleporter devices used by the Forerunners vary in size and shape; the smallest ones allow transit of one person at a time, while larger pads can translocate many individuals at once. Teleporters typically consist of a vertical slipspace field suspended between two emitters; one above the field and the other below it. The translocation pads on Onyx were four meters wide, seven-sided flat surfaces. When looking at the surface, one's gaze would appear to slide deeper into it, as if they were looking at something infinitely deep, or complete nothingness. The teleporters leading to the Apex Site on the Etran Harborage enveloped an individual in a slipspace field by means of a ring that extended upward from the platform when the device was activated. The Apex's teleporter also doubled as a containment field device. Like translocation in general, passage through teleporters typically causes feelings of nausea on humans, due to the uncertainty errors involved. Other slipspace fields, such as those generated by slipspace field pods, block incoming translocation if placed on a pad. However, they can nonetheless be transported by teleporters; when a translocation pad is activated, any compressed slipstream fields on it are caught in the local spatial distortion. The Covenant acquired this technology to a degree in one of their countless relic-hunts, and later utilized it in Spires, large structures that could teleport forces to the ground from a ship overhead. They were used to an extent in the Fall of Reach. The Banished, in particular shipmaster Let 'Volir, utilised teleportation extensively during the Second Ark Conflict. In the Halo games, teleporters appear mostly in Multiplayer. They are most often seen on Forerunner and Covenant structures, on levels such as Blood Gulch and Beaver Creek. In some multiplayer maps such as Elongation however, teleporters can be found on clearly human-constructed structures. This is most likely a non-canon gameplay element, as no canon source has indicated that humans would possess such advanced technology. Teleporters usually appear green, with the exceptions of Cold Storage; Citadel and Gemini, where the teleporters are blue. In Halo 3, teleporters were present in hardly any multiplayer map because Bungie thought it was too easy to "camp" near them and get easy kills. Instead, Man Cannons took their place for the most part. Despite this, teleporters were reintroduced in the recently released map Avalanche, as well as appearing on Cold Storage. Teleporters are available, however, in Forge for every Halo 3 map. In Halo 3, when a person enters a teleporter and is going at a high speed (most likely caused by a jump from above), they keep their momentum and come out at the same speed, but in the direction it is aiming (indicated by the glowing polygon at the teleporter's base). In Halo Wars, they appear as Forerunner teleporters. A clever, though usually considered cheap, strategy involving teleporters is to go through one, then immediately move backwards. If the space behind it goes back far enough, then the player can camp behind the teleporter. In Halo: Combat Evolved, Halo 2 and Halo 3, it is possible to block the teleporters (especially in Blood Gulch) with a vehicle or by simply standing on them. Telefragging is the use of a teleporter to kill somebody standing on top or inside another teleporter. The player standing on top of the "receiver node" of the teleporter will have the screen slowly turn white before being killed as a "suicide" (this only occurs in Halo: Combat Evolved, 'Halo 2, and Halo Trial, in Halo 3 it says it is blocked). In Forge, if teleporter A connects to both teleporters B and C, then if a player enters teleporter A in the opposite direction of the glowing indicator on its base, said player will be transported to teleporter B every time; conversely, if the player enters teleporter A in the same direction of the glowing indicator on its base, said player will be transported to teleporter C every time. In Halo: Reach, it is possible to change what goes through the teleporter. For example, the player can make it so that vehicles can go through but not individual players. A teleporter in Halo 2. 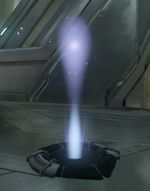 A teleporter in Halo: Reach. Concept art of a Covenant Teleporter Pad in Halo Wars. A Banished army being teleported.